Design is important, not only to those in the design business but also to business owners, customers, stockholders, manufacturers, and the like. Technology and engineering is vitally important, but if Tesla packaged its high-tech electric cars in a Pontiac Aztek body we would not know the name Elon Musk. If Apple decided to sell its phones in a pink Hello Kitty flip case, they would not exist today. Good design matters and great design builds success. Car wash owners want great-looking, eye-popping facilities. Design is not just about making products and buildings more attractive. It is a way of thinking, a creative process spanning entire organizations driven by the desire to better understand and meet customer needs. Great design has moved from the drawing board to the boardroom. Car wash owners do not want good-looking buildings these days, they want great-looking, eye-popping facilities that rival other retailers. This is fantastic for the industry because it is changing the mindset of consumers when they think of a car wash. 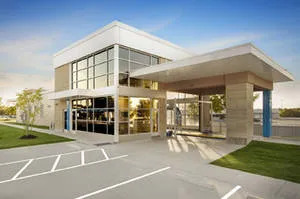 When we design a building for a client, we are also designing and building a relationship — a relationship not only with the car wash owner, but also with the city or town in which it is located and the customers who use its services. Each design needs to reflect the owner’s identity and the experience they plan for the customer. The history professor Adrian Forty said, “No design works unless it embodies ideas that are held common by the people for whom the object is intended.” If you desire your customers to be of solid character and drive nice, well maintained vehicles, your building should reflect this. The car wash design influences how inviting it is to customers. 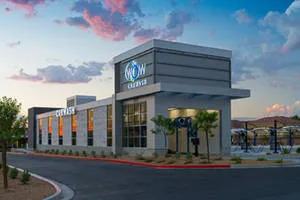 The car wash building has evolved over the past 20 years from four walls and a roof to a true expression of its function, accented with the owner’s excitement for the industry and their commitment to customer service. 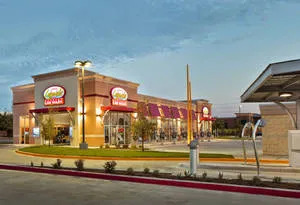 The design of your new car wash or the renovation of your existing facility can determine the success of your business. Like the all-important decision of location, location, location, the car wash design influences how inviting it is to customers. Washing one’s car can be a split-second decision. If the car wash looks ho-hum, the potential customer is likely to drive on by. If it looks exciting, clean, and sleek, the customer will want to drive on site and join the party. There is a saying that bad design is like wearing a rumpled suit. It doesn’t mean you are a bad person, but it may give people the wrong initial impression. That impression takes time to change and convince potential customers that your car wash is fantastic, and that you will take care of them, regardless of the dressing. With the competitiveness and compaction of the car wash industry, this “time to change” can break the bank. Buildings are an integral part of the brand. Branding is a billion-dollar business. Companies spend millions to get the right look and colors to evoke a positive response from potential customers. The business logo and brand tell the company story. It needs to be simple and clear. If it is too complicated the message might not be conveyed. The main two differences between the logo and the building is the cost and size. A building will cost a lot more and is more difficult to change. The building is also a very large element, taking up a lot of space. This is one reason to get your building designed right. Color selection and restraint is a very important design decision. Businesses commonly overuse bright colors to overcome poor visibility or lack of good design. The overuse of color is common in the car wash industry. Just look at most menu boards, canopies, and vacuum equipment and you will be flooded with red, blue, yellow, orange, and green. Primary and secondary colors are fine to use, but pick one or two and use them sparingly. Color is like a good beer, it should be used responsibly and in moderation or it results in a blurry drunken mess. Color selection and restraint is an important design decision. Look at the logos of some of the most popular companies and you will find only one or two colors. When using more than two colors, make sure they work well together — and use no more than two primaries or secondaries. Many trendy colors are being used but realize they can eventually fade in popularity. Black, white, and grays are always a good basis for design that allows the use of one additional color to create the pop. Earth tones are popular go-tos for building colors but they are good background, transparent colors that work to blend in, but do not stand out. Good design doesn’t need to scream at you for it to be seen but it cannot be transparent. Cities are getting more involved in color selection of buildings. Many cities in the Dallas-Fort Worth metroplex restrict the use of any primary color. No red, blue or yellow here. One city even restricted the color orange, so Home Depot had to use Gold colored signage. Upscale developments are also restricting or defining the colors of buildings and signage to keep a free-for-all color palooza from happening. 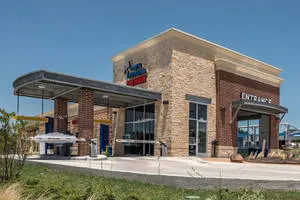 Keeping the building simple in color will allow a car wash owner to expand to the more restrictive markets while keeping their design and brand intact. can be arranged in many different ways. Great design does not need to cost a fortune. A simple clean car wash can be made of simple materials and methods and still be a good design. The use of concrete block, brick, stone, metal, and glass can be arranged in many different ways. How they are put together and how much each material is used can affect the final design and cost. Good design is not cheap. If you want a cheap building, expect cheap customers who will not blink an eye to complain about the service they are getting. The site design should provide a great foundation for the building and brand to do their work. Clear drives and easy to follow paths to the pay stations, through the wash tunnel, and to the vacuum areas are paramount. Well designed and placed landscaping can enhance a great building design and hide some not-so-attractive areas on the site. Directional signage should be clearly visible, and its design should reinforce the brand with their colors and shapes. Don’t go for the red-yellow primaries if they don’t reinforce and blend well with the overall design. The well designed car wash must be a good neighbor with the other buildings and businesses in the area. Many times, a nice new car wash in an older part of the city acts as the impetus for other businesses to upgrade their building and site. We are witnessing a time when the car wash is not the ugly duck on the street but a critical player in high-quality development. 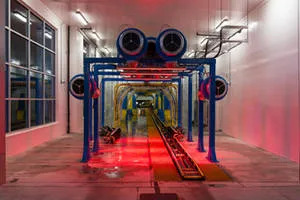 I have seen nicely designed car washes replace older unattractive buildings and within a few years help attract more new developments and upgrades along the street. Clear drives and easy to follow paths are paramount. I don’t want to discount how important solid and innovative engineering must be for the product to work and sell. Engineering is equally important in building and operating a car wash. If the engineering doesn’t work, the product will not sell. It might not be the aesthetically pleasing part, but it makes the pretty package into a sellable product or service. The two components, package design and product engineering, don’t always live in harmony, but each one has to understand the other’s importance in the complete product or service. Taking care of a well-designed car wash building is very important. There are many new car wash buildings that after only a few years look like they are 10 years old. I have seen the reverse as well. A car wash is providing a service to car owners allowing them to take care of their car and keep it in good condition. The car wash building needs the same level of care and attention. Don’t let a nicely designed building fall apart and tarnish. It is difficult for me to go to a car wash that was designed only a few years ago and see it already looking tired and weary. Most of our clients provide routine maintenance weekly or monthly, and their washes look great 10 and 15 years later. It’s all about great design backed with solid engineering. The Pontiac Aztek was a good solid car, but its strange exterior design is one of the reasons Pontiac quit building it — and eventually Pontiac died as a brand. Tesla is the hottest auto manufacturer on the planet and cannot build cars fast enough to keep up with demand. It’s all about great design backed with solid engineering. If you are building a new wash or your existing wash lacks either good design or solid engineering, get a plan together and create a team of great architects and engineers and get it fixed. It’s a competitive market out there and only the best will thrive. Trent Clark is the founder and lead architect with A Plus Design Group, a multi-state-registered firm located in Flower Mound, TX. You can visit the firm on the web at www.apdg.us.